So happy to release MongoBooster 3.5 today. This version distributes Linux application in the AppImage format, add Azure DocumentDB support along with some useful minor improvements and bugfix. added: Short cut “Mod+0” - “toggle Output Panel” to maximize the script editor. added: Short cut “Mod+9” - “toggle Editor Panel” to maximize the output panel. fixed: can’t add double/integer value into the nested array. fixed: import JSON file which only contain single JSON object doesn’t work. fixed: shell tab can’t be closed when the tab name includes space char. fixed: Kerberos Library is not installed issue. fixed: Error connecting to Mongodb Atlas replicaset. This version packages desktop applications as AppImages that run on common Linux-based operating systems, such as RHEL, CentOS, Ubuntu, Fedora, debian and derivatives. An AppImage is a downloadable file for Linux that contains an application and everything the application needs to run (e.g., libraries, icons, fonts, translations, etc.) that cannot be reasonably expected to be part of each target system. Microsoft’s NoSQL document database service DocumentDB now supports drivers for MongoDB. So if you were using existing MongoDB tools and libraries, you can now use them with DocumentDB and take advantage of Microsoft’s cloud architecture. 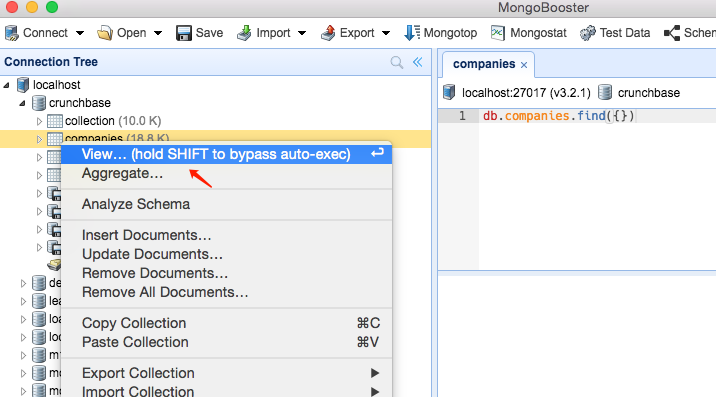 We have tested the MongoBooster with DocumentDB. It works well. This version added a new handy “Hold SHIFT key to bypass auto-exec …” collection action to disable automatic execution when opening a large collection.. This version also added a “save to file” button to shell log window to export shell log. Fixed, Missing add icon in the black theme. Improved, remove some code template’s redundant comment.